S. 2155 includes a provision clarifying that a manufactured housing retailer or seller is not inappropriately considered a mortgage “loan originator” simply because they provide a customer with some assistance in the mortgage loan process. S. 2155 passed the House on Tuesday by a strong bipartisan vote of 258-159 and the U.S. Senate in March by a vote of 67 to 31. MHI thanks the Representatives and Senators who supported this important manufactured housing provision. Click here to see how your Representative voted on S. 2155 and here for how your Senators voted. MHI is grateful to Senate Banking Chairman Michael Crapo (R-ID), House Financial Services Committee Chairman Jeb Hensarling (R-TX), and the authors of the manufactured housing provision in S. 2155, Senator Joe Donnelly (D-IN) and Representative Andy Barr (R-KY), for their persistent efforts to make this important change a reality. MHI appreciates the bipartisan group of champions in the House and Senate who originally sponsored the Preserving Access to Manufactured Housing Act (S. 1751/H.R. 1699), including: Senators Joe Donnelly (D-IN), Pat Toomey (R-PA), Joe Manchin (D-WV), Tom Cotton (R-AR), Gary Peters (D-MI), and Tim Scott (R-SC); and Representatives Andy Barr (R-KY), Kyrsten Sinema (D-AZ), Bruce Poliquin (R-ME), Terri Sewell (D-AL), David Kustoff (R-TN), and Kathleen Rice (D-NY). MHI also thanks all members of the House and Senate who cosponsored S. 1751 and H.R. 1699, whose names can be found at the preceding links. 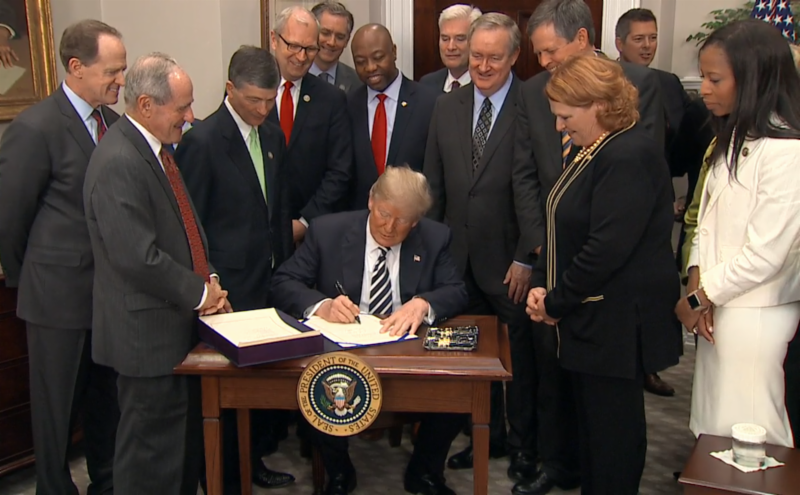 He also commend the bipartisan group of Senators who included the manufactured housing provision in this package of Dodd-Frank Act reforms, including Chairman Crapo (R-ID) and Senators Heidi Heitkamp (D-ND), Jon Tester (D-MT), Joe Donnelly (D-IN) and Mark Warner (D-VA). S. 2155 becoming law is a result of MHI’s ongoing efforts to protect manufactured housing retailers and sellers from liability under federal consumer protection mortgage rules for the loan portion of a consumer transaction. MHI has continually argued that if a retailer or seller does not receive compensation or gain related to the loan, they should not be considered a loan originator simply because they help borrowers identify potential lenders or provide minimal assistance during the loan process. MHI’s government affairs team worked closely with both Senate and House leadership and congressional champions of manufactured housing to secure passage of this important provision. The grassroots outreach from MHI members and state executive directors – totaling more than 20,000 calls and emails – was instrumental in helping members of Congress understand the importance of this provision to their constituents. MHI succeeded over the last few years in getting a similar provision included in several previous House-passed bills (H.R. 1699, H.R. 10, H.R. 650, H.R. 1779 and FY 2017 and 2018 appropriations bill), as well as a freestanding Senate manufactured housing bill (S. 1751 and S. 682).